Focus on elegant, sophisticated design and attention to detail Fuel consumption down to class-leading 4.1 L/100 km in the Volvo S80 New, intuitive Sensus Connected Touch system Enhanced IntelliSafe systems Active High Beam Control for more relaxed driving at night "The new features in the new Volvo S80 and XC70 are based on our human-centric approach, which has been a Volvo hallmark for more than 85 years. They take the elegant sophistication of our largest models to a new level," says Lex Kerssemakers, Senior Vice President, Product Strategy & Vehicle Line Management at Volvo Car Group. He continues: "We pave the way for our future model lineup by bringing the three models visually closer to each other. The renewal is one of the most extensive in our history, with the main focus on improved quality and attention to detail." 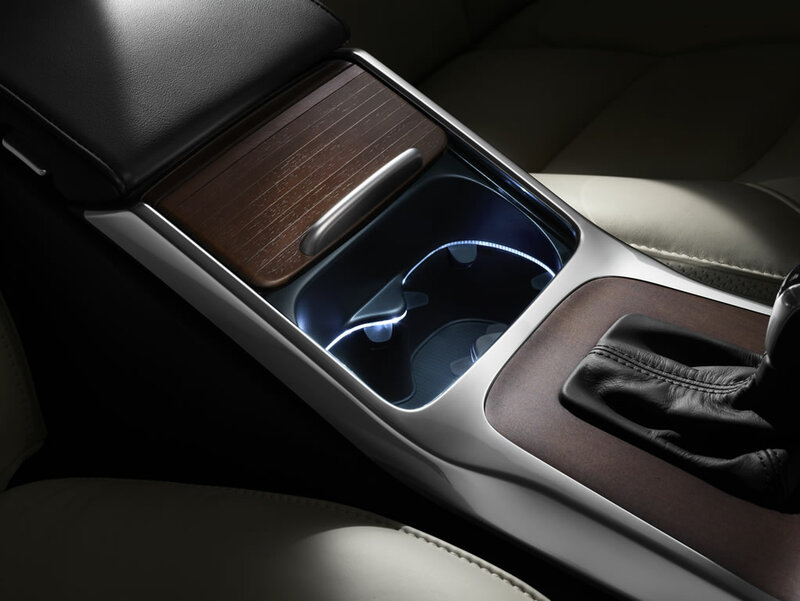 A number of new exterior design cues reinforce the sophisticated contemporary presence of the new Volvo S80. The new front and rear bumpers create a ‘stretched' effect to make it look wider and lower. New rectangular Daytime Running Lights at the front give the S80 nose a more contemporary look, while the rounded off classic Volvo lights at the rear visually pull the car down to the ground. The S80 can be fitted with expressive 19-inch wheels without loss of comfort. "The whole effect adds a sophisticated elegance to the car," explains Fedde Talsma, Design Director, Exterior. "We have created a wider proportion on the front grille and added more detail such as chrome exterior highlights to give the car an elegant and upmarket feel." "We are very proud of having Bridge of Weir in Scotland as a supplier of our quality leather seats. Their genuine cowhide has far less surface treatment than that in other premium cars, making it feel softer and more natural," says Lena Jiseborn, Design Director, Colour and Trim. "The quality of the seats and other materials used in the car give the car a true Scandinavian feel," she continues. And under the skin, at the heart of the best driving experiences is a great chassis. The S80 buyer can choose from three chassis types - Comfort, Lowered Sport Chassis and Four-C (Continuously Controlled Chassis Concept). Volvo Cars paved the way for a totally new segment with the V70 Cross Country in 1997. "Our main focus in the continuous development of the XC models has been to create a very comfortable on-road car with capable, off-road potential. The rugged and refined contemporary look reflects the XC70's underlying strength and capability. Think of it as an exclusive goose down jacket, designed around those who like their adventure with a true feeling of sophistication," says Lex Kerssemakers. All-Wheel Drive and the optional Hill Descent Control are a further boost to the XC70's go-anywhere promise. A number of new exterior design cues sharpen the XC70's contemporary road presence. These include a front grille with a bold, wider proportion, a new bigger ironmark, and details such as the Daytime Running Lights and added matte silver touches. The XC70 is available with wheels up to 19-inches in diameter. "Our aim is to emphasise the luxurious feel with a more road-hugging stance. The XC70 should look perfectly at home in any environment, whether it's in the middle of the open country or a country club car park," says Fedde Talsma. As with the V70, the rear seats can be folded down in three 40/20/40 segments. Fold all of the rear seats flat and the load space grows from 575 litres to 1,600 litres. Another human-centric detail is the power-operated tailgate. The rear seat can integrate double two-stage child seats - booster cushions that offer children from the age of three and upwards a comfortable and safe ride height. Internet streaming of music A global choice of Internet radio via TuneIn and Orange Live Radio Full Internet browsing (except when driving) On-line Google Map with Google Search Embedded Connected 3D navigation with online traffic info and dangerous zone warnings Free Parking locator TripInfo that reads out Wikipedia information about interesting points along the route Native and web applications and App Store for new functions and updates Weather information and forecasts A Volvo service locator "The voice-activation system works on all music sources connected to the Connected Touch," says Project Director Patrik Widerstrand, adding: "It is also possible to share a WiFi network with everyone in the car." The Eco mode has a green colour theme and is designed to encourage and reward a fuel-efficient driving style. The Eco meter on the left displays current and accumulated fuel consumption - and optimal eco-driving is rewarded with a green E light. Cars equipped with a rain sensor can now also get an electrically heated windscreen for rapid de-icing on cold winter days. To give drivers in cold climate extra comfort, three-spoke steering wheels can now be specified with electric heating. Cars with automatic transmission can get paddle shifters that give the driver the opportunity to shift gear manually with both hands on the wheel. IntelliSafe, Volvo's blanket name for all active safety systems, is an important part of the driver-centric approach in the S80 and XC70. The world-first City Safety technology is fitted as standard, and this advanced safety system now works at speeds of up to 50 km/h. All three models can also get Pedestrian Detection with full auto brake, which watches out for people walking into the car's path. Road Sign Information supports the driver by displaying road signs on the instrument display. "As the leader in automotive safety, we have reduced the risk of being involved in an accident or being injured in one of our latest car models by abound 50 per cent since the year 2000. By continuously introducing new preventive and protective systems, we keep moving towards our safety vision that nobody should die or suffer serious injuries in a new Volvo car by the year 2020," says Thomas Broberg, Senior Safety Advisor at Volvo Car Group.